Host APCs are required for initiating T cell-dependent acute graft-vs-host disease (GVHD), but the role of APCs in the effector phase of acute GVHD is not known. To measure the effect of tissue-resident APCs on the local development of acute GVHD, we selectively depleted host macrophages and DCs from the livers and spleens, but not from the skin, peripheral lymph nodes (PLN), or mesenteric lymph nodes (MLN), of C57BL/6 (B6) mice by i.v. administration of liposomal clodronate before allogeneic bone marrow transplantation. 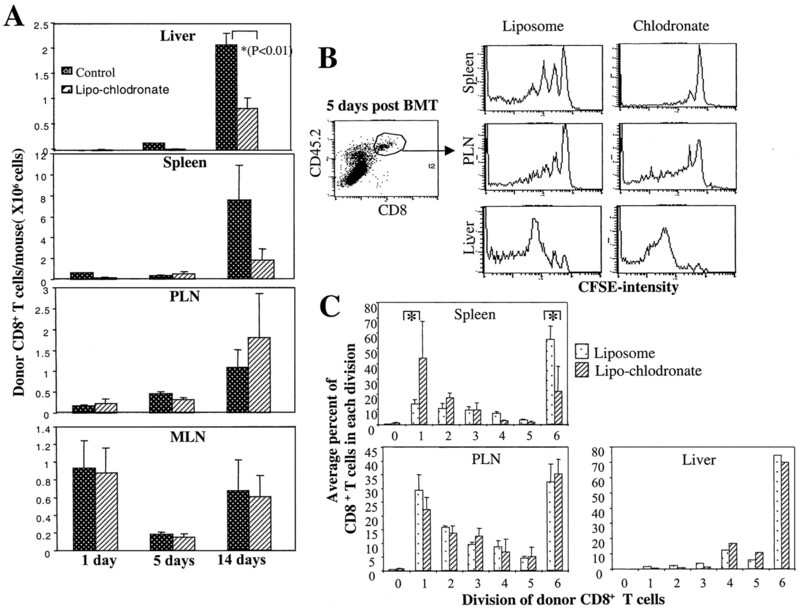 Depletion of host hepatic and splenic macrophages and DCs significantly inhibited the proliferation of donor C3H.SW CD8+ T cells in the spleen, but not in the PLN or MLN, of B6 mice. Such organ-selective depletion of host tissue APCs also markedly reduced the trafficking of allogeneic CD8+ T cells into the livers and spleens, but not PLN and MLN, of B6 recipients compared with that of the control mice. Acute hepatic, but not cutaneous, GVHD was inhibited as well, resulting in improved survival of liposomal clodronate-treated B6 recipients. When C3H.SW CD8+ T cells were activated in normal B6 recipients, recovered, and adoptively transferred into secondary B6 recipients, activated donor CD8+ T cells rapidly migrated into the livers and spleens of control B6 recipients but were markedly decreased in B6 mice that were depleted of hepatic and splenic macrophages and DCs. Thus, tissue-resident APCs control the local recruitment of allo-reactive donor T cells and the subsequent development of acute GVHD. Graft-vs-host disease (GVHD)3 is the most important complication of myeloablative and nonmyeloablative allogeneic bone marrow transplantation (allo-BMT). In the setting of MHC-matched allo-BMT, GVHD is induced by donor T cells recognizing minor histocompatibilty Ags (miHAs), which primarily target specific organs, such as skin, liver, and intestine (1, 2, 3, 4, 5). In a mouse model of miHA-initiated acute GVHD, we recently found that host APC activation of donor T cells is sufficient to initiate both the activation and effector phases of T cell-mediated acute GVHD (6, 7). Most recently, Teshima et al. (8) further demonstrated that host APCs are required for both the T cell activation and effector phases of acute GVHD, whereas alloantigen expression on host target epithelium is not essential for alloreactive T cell-mediated host tissue damage in the skin, livers, and intestines of recipient animals. However, it is not well understood how these organs become the main targets of activated alloreactive T cells. Cell-mediated cytotoxicity is critical to the tissue injuries in GVHD, although damage to the gastrointestinal tract can amplify disease in other tissues (1, 2, 3, 9, 10, 11, 12, 13, 14). Initial studies indicated that the infiltration of allogeneic CD8 T cells into the livers of recipient mice began as early as 4 days and peaked by 14 days following allo-BMT (15, 16, 17). Inhibition of CD8 T cell migration into the livers of recipient mice could significantly reduce the hepatic damage as well as the severity of acute GVHD in recipient mice (15, 17). Interestingly, the accumulation of donor CD8 T cells in the skin began by day 14 and peaked between days 28 and 35 after allo-BMT, in parallel with the occurrence of clinical signs of cutaneous GVHD (18). A recent study by Dickinson et al. (19) demonstrated in an ex vivo skin-explant model that the degree of CTL infiltration correlated directly with the severity of graft-vs-host reactions. In contrast, necrosis of the individual cells in intestinal crypts was the first change detected by light microscopy, and there was no apparent increase in lamina propria lymphoid cells in the vicinity of crypt necrosis (20). Thus, T cell-mediated toxicity is particularly critical to the injuries in the liver and skin (1, 2, 3, 20). Therefore, identifying the mechanism(s) by which alloreactive T cells are recruited into the liver and skin is important for understanding how T cells selectively target specific tissues in the recipients with acute GVHD. Several lines of evidence suggest that tissue-resident APCs, such as macrophages and dendritic cells (DCs), are related to the development of T cell immunity. Depletion of macrophages and DCs from the livers and spleens of mice could inhibit T cell-mediated lysis of viral-infected hepatocytes. Specific elimination of macrophages from skin but not from drainage lymph nodes significantly decreased the number of locally infiltrating T cells and DCs, which resulted in the regression of cutaneous inflammation in mice of an autoimmune disease model (21). In experimental GVHD models, direct contact between dermal DCs and allogeneic T cells has been observed in the skin from recipient mice with allo-BMT (18, 22). Furthermore, in an ex vivo skin-explant assay, preincubation of skin sections with hematopoietic cells could significantly enhance the infiltration of CTLs in the skin sections (19). Taken together, these data suggest that residual hematopoietic APCs in skin may be essential for the development of cutaneous GVHD (19). However, it remains unclear whether resident liver macrophages and DCs are essential for the development of hepatic GVHD. Moreover, whether local tissue APCs prime naive allogeneic T cells to host Ags, or whether their major role is to recruit activated allogeneic T cells into target tissues, is unknown. In this study, using miHA-mismatched donor C3H.SW and recipient C57BL/6 mice, we now report that tissue-specific depletion of hepatic and splenic APCs by systemic administration of liposomal clodronate (lipo-clodronate) significantly reduces the recruitment of activated allogeneic CD8+ T cells into the livers of B6 recipient mice. This selective APC depletion also results in the inhibition of acute GVHD, but this effect is largely confined to the liver, where resident APCs were depleted. Partial APC depletion and GVHD amelioration result in partially improved survival of lipo-clodronate-treated mice. These results indicate that tissue-resident APCs play an important role in directing activated allogeneic CD8+ T cells to the target organs of acute GVHD. B6 (H-2Db, CD45.2 +) or B6/SJL (H-2Db, CD45.1+) recipient mice, and miHA-mismatched C3H.SW (H-2Db, CD45.2+, and Ly9.1+) donor mice were purchased from The Jackson Laboratory (Bar Harbor, ME) and maintained in sterile conditions. Drinking water of bone marrow transplantation (BMT) recipients was supplemented with neomycin sulfate and polymyxin B (Sigma-Aldrich, St. Louis, MO) from 2 days before irradiation or systemic administration of mice with lipo-clodronate until 3 wk posttransplant. Abs for immunofluorescence and immunohistochemistry staining and cell separation, including anti-CD8 (clone RM4-5), biotinylated anti-mouse IFN-γ, biotinylated anti-CD11b (clone M1/70), biotinylated anti-CD11c (clone HL3), biotinylated anti-NK1.1, and biotinylated anti-B220, were obtained from BD PharMingen (San Diego, CA). Biotinylated anti-F4/80 was purchased from Serotec (Oxford, U.K.). FITC-anti-CD11a, FITC and PE-conjugated streptavidin, PE-anti-CD11c, CyChrome-anti-CD8, and CyChrome-streptavidin were also obtained from BD PharMingen. All anti-CD4, anti-CD8, anti-B220, anti-CD11b, and anti-CD11c Abs conjugated with microbeads and the streptavidin conjugated with microbeads were purchased from Miltenyi Biotec (Auburn, CA). Lipo-clodronate was prepared as described by van Rooijen et al. (23) with slight modification (24). Briefly, lipids composed of 86 mg of egg phosphatidylcholine (Sigma-Aldrich) and 19 mg of cholesterol (Sigma-Aldrich) were dissolved in 10 ml of chloroform. The organic solvent was removed under reduced pressure in a rotary evaporator and the resulting film was desiccated overnight. The thin, dry film was redehydrated in a suspension of 10 ml of PBS (pH 7.5) containing 2.0 g clodronate (Sigma-Aldrich). The liposomes were sonicated for 3 min at 20°C in a water bath sonicator. Lipo-clodronate was purified by three centrifugation washes at 4,000 × g for 20 min, and lipo-clodronate was resuspended in 4 ml of PBS. Lipo-clodronate can be selectively taken in by macrophages and myeloid DCs in the spleen and liver (23, 25). The phospholipid bilayers of liposomes are disrupted by lysosomal phospholipases, and clodronate is intracellularly released to inhibit the cellular metabolism, which induces cell suicide. In contrast, the extracellular free clodronate cannot easily cross cell membranes and has an extremely short t1/2 in circulation and therefore is not toxic to cells (23). Previous studies have determined that i.v. administration of mice with 200 μl of lipo-clodronate prepared in this way can deplete macrophages and DCs in the spleen and liver (23, 25). In preliminary studies, we repeated these measurements, following i.v. injection of 25–400 μl of lipo-clodronate/mouse, and found that depletion of DCs and macrophages peaked and plateaued between 100 and 200 μl. Doses >250 μl of lipo-clodronate were toxic to the mice and increased immediate peri-BMT mortality (we detected swollen kidneys, but are otherwise unsure of the mechanism underlying this high-dose toxicity), without any additional increase in APC depletion. Therefore, we chose to treat each mouse with 150 μl of lipo-clodronate, containing ∼0.75 mg of clodronate (23), to ensure that we were well within the dose-response plateau without risking non-APC-related toxicity. Donor bone marrow cells were prepared from C3H.SW mice as previously described (6). T cell-depleted bone marrow (T−BM) cells were isolated with anti-CD4 and anti-CD8 Abs conjugated with magnetic microbeads. Donor CD8+ T cells were purified from C3H.SW mice by one of two protocols. On the first, donor CD8+ T cells were positively selected from spleens and lymph nodes of C3H.SW mice by anti-CD8 Ab conjugated with magnetic microbeads. Alternatively, donor CD8+ T cells were negatively selected by depletion of CD11b, NK1.1, B220, and CD4 cells using magnetic cell sorting (MiniMACS; Miltenyi Biotec). Because murine DCs express CD8 Ag (26), CD11c+ cells were also completely removed by anti-CD11c Ab conjugated with microbeads before purifying donor CD8+ T cells based on magnetic separation. The purity of isolated donor CD8+ T cells was always >95%, as reanalyzed by flow cytometry. Purified C3H.SW donor CD8+ T cells were resuspended at a concentration of 1 × 107 cells/ml in 2.5% FBS in PBS. CFSE (Molecular Probes, Eugene, OR) was added to a final concentration of 5 μM. Labeling was quenched with ice-cold PBS after 15 min of incubation at 37°C. Cells were washed twice in PBS and resuspended in PBS for transplantation. Mice underwent allo-BMT as previously described (6). Briefly, B6 recipients were irradiated with 9.5 Gy administered in two fractions from a 137Cs source. C3H.SW CD8+ T cells (2 × 106), mixed with or without C3H.SW T−BM cells (7 × 106), were transplanted into B6 recipients via tail vein injection (five to eight mice per group per experiment) immediately after irradiation. Recipient mice were weighed twice weekly and monitored for the clinical signs of acute GVHD and survival. The clinical grading criteria for the cutaneous inflammation of acute GVHD were followed as established. Hepatic lymphocytes were isolated as previously described (27). Briefly, livers from recipient B6 mice were minced and suspended in PBS containing 1 mM EDTA. Percoll was added to the cell suspension (Amersham Pharmacia Biotech, Piscataway, NJ) to a final concentration of 33%. After centrifugation for 30 min at room temperature, hepatic lymphocytes were collected from the bottom and contaminating RBCs were lysed. Assays of intracellular IFN-γ in donor T cells were performed as previously described with slight modification (28). Briefly, splenic and hepatic lymphocytes were cultured in medium without stimulation or in the presence of precoated CD3 Ab and MC57SV cells (H-D2b) irradiated with 30 Gy in MicroWell plate for 16 h. GolgiStop containing monensin (BD PharMingen) was added into the cultures at the final 6 h to block intracellular transporter of IFN-γ. Cells were collected and stained with CyChrome-anti-CD8 Ab combined with or without FITC-anti-CD45.2. After fixation and permeabilization using Cytofix/Cytoperm containing formaldehyde and saponin (BD PharMingen), cells were washed, stained with biotinylated anti-mouse IFN-γ and then PE-conjugated streptavidin, and then analyzed by flow cytometry. Immunofluorescence analyses were performed as previously described (29, 30). In tri-color analyses, mononuclear cells from spleen, PLN that includes popliteal, superficial inguinal, axillary, and salivary lymph nodes, MLN, liver, and peripheral blood were stained with FITC-conjugated anti-Gr-1, PE-conjugated anti-CD11c Abs, and biotinylated anti-CD11b or biotinylated anti-F4/80 followed by revealing with CyChrome-streptavidin. In other experiments, CFSE-labeled CD8+ T cells were further stained with CyChrome-anti-CD8 coupled with biotinylated anti-CD45.2 and PE-conjugated streptavidin. Cells were analyzed by FACScan (BD Biosciences, Mountain View, CA). Mice were sacrificed and specimens of liver, skin, and intestine were taken for histopathologic analysis. All samples were placed in 10% neutral buffered formalin (Sigma-Aldrich), embedded in paraffin, sectioned, and stained with H&E for histopathologic assessment for acute GVHD (2, 31). The murine cutaneous GVHD was graded according to the criteria established by Kao and coworkers (32). Recipient spleens were frozen in O.C.T. embedding medium (Sakura Finetek, Torrance, CA). Six-micrometer frozen sections were cut, air-dried, fixed in acetone, and rehydrated in PBS. Spleen sections were incubated with biotinylated hamster anti-mouse CD11c Ab (BD PharMingen) followed by PE-conjugated streptavidin (Vector Laboratories, Burlingame, CA). Nonspecific binding of biotin and avidin was blocked by addition of excess avidin and biotin using the blocking kit (Vector Laboratories). Isotype-matched rat IgG (BD PharMingen) was used as a negative control. After staining, the slides were coverslipped using Vectashield H-1200 (Vector Laboratories) and observed under fluorescent microscope (Nikon Microphot-FXA; Nikon, Melville, NY). Immunohistochemistry staining of the liver was performed as previously described (33). The cryosections of liver were stained with rat biotinylated anti-CD8 Ab (BD PharMingen) followed by HRP-conjugated goat-anti rat IgG (F(ab′)2) (Vector Laboratories) staining. Sections were developed with diaminobenzidine substrate kit (Vector Laboratories). Isotype-matched rat IgG (BD PharMingen) was used as a negative control. Survival data were analyzed by life-table methods using the Mantel-Peto-Cox summary of χ2. Student’s t test was used to analyze the difference of APC depletion and T cell infiltration and migration in vivo. Values of p < 0.05 were considered significant. To establish a mouse model for investigating the role of host tissue-resident macrophages and DCs in mediating organ-related acute GVHD, lipo-clodronate (150 μl per injection per mouse) was administered via tail vein at day −7 via tail vein and i.p. at day −2. Control B6 mice received identical injections of empty liposomes. Immunofluorescence staining was performed to monitor the depletion of macrophages and DCs from the livers, spleens, PLN, MLN, and peripheral blood by the day of allo-BMT. At day 0, the overall number of mononuclear cells in the spleens of lipo-clodronate-treated mice was reduced from 8.2 ± 1.1 × 107 to 1.9 ± 0.67 × 107 per spleen. Flow cytometry analysis showed that up to 85% of F4/80+ macrophages and 75% of CD11c+ DCs in the spleens were eliminated in these mice, compared with control B6 mice treated with empty liposomes (Fig. 1⇓A). Lipo-clodronate treatment also eliminated >75% of F4/80+ macrophages from the liver and peripheral blood (Fig. 1⇓A). CD11c+ DCs were detected in the liver only at very low levels and were further depleted by lipo-clodronate. In contrast, lipo-clodronate did not affect macrophages and DCs in the PLN, MLN (Fig. 1⇓A), or skin and other cell populations in PLN and MLN (data not shown). Furthermore, immunofluorescence staining showed that aggregation of CD11c+ DCs (red color) and the apposition of CFSE-CD8 T cells (green color) next to CD11c+ DCs were abrogated in the spleen of lipo-clodronate-treated B6 recipients at 6 h following irradiation and cell transplantation of C3H.SW T−BM cells and CD8+ T cells (Fig. 1⇓B). Taken together, these results indicate that lipo-clodronate treatment creates an organ-specific depletion of macrophages and DCs in the liver and spleen. Depletion of macrophages and DCs from the spleens and livers of the recipient B6 mice. Lipo-clodronate (150 μl) was administered at day −7 via tail vein and at day −2 via peritoneum. The eliminating effect of lipo-clodronate on host macrophages and DCs in the spleen, liver, PLN, MLN, and peripheral blood were examined at day 0. A, Leukocytes were isolated from the liver, spleen, PLN, MLN, and peripheral blood of control and lipo-clodronate-treated mice, stained with PE-conjugated anti-CD11c Ab, FITC-labeled anti-Gr-1 Ab, and biotinylated F4/80 or CD11b that was revealed by CyChrome-conjugated streptavidin. The average percentage of CD11c+ DCs and F4/80+ macrophages in the indicated tissues and lymphoid organs were summarized. B, CFSE-labeled donor naive CD8+ T cells (2 × 106; green) derived from C3H.SW mice were i.v. injected at day 0 into lethally irradiated B6 recipients treated with liposomes or lipo-clodronate at day −7 and day −2. Spleens were taken from the recipients at 6 h following lethal irradiation and CD8+ T cell transplantation and cryosectioned for immunofluorescence staining with biotinylated anti-CD11c Ab followed by PE-conjugated streptavidin (red). Data represent one of three independent experiments. 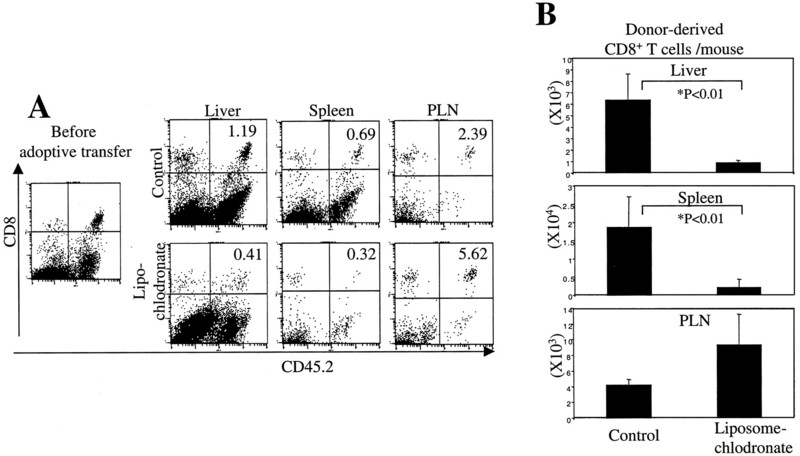 To assess whether depletion of macrophages and DCs might influence the recruitment of donor CD8+ T cells into local tissues, C3H.SW T−BM and CFSE-labeled CD8+ T cells (CD45.2) were infused into lipo-clodronate-treated B6 mice (CD45.1) or control B6 mice at day 0. Lymphocytes were recovered from recipient livers, spleens, PLN, and MLN at 1, 5, and 14 days following transplantation, enumerated, and stained for flow cytometry analysis. When compared with T cell infiltration in control B6 recipients, donor CD8+ T cell infiltration was reduced in the livers of lipo-clodronate-treated recipients by 6.8-fold at day 5 and 2.6-fold at day 14 following allo-BMT. By 14 days, there was a 4-fold decrease in the number of donor CD8+ T cells in the spleens from lipo-clodronate-treated recipients (Fig. 2⇓A). In contrast, lipo-clodronate treatment had no effect on the recruitment of donor CD8+ T cells into PLN and MLN (Fig. 2⇓). Thus, this organ-specific depletion of host APCs only reduced the recruitment of donor CD8+ T cells into the tissues from which APCs had been removed. Organ-specific depletion of host macrophages and CD11c+ DCs decreases the recruitment of allogeneic CD8+ T cells into the local organs. Naive C3H.SW CFSE-labeled CD8+ T cells (2 × 106; CD45.2+) were mixed with 7 × 106 T−BM cells and i.v. injected at day 0 into lethally irradiated B6/SJL recipients (CD45.1+) that were previously treated with liposomes or lipo-clodronate at day −7 and day −2. A, At the indicated time points following the cell transfer, leukocytes were prepared from spleen, PLN, and MLN from these mice and double-color-stained with CyChrome-conjugated anti-CD8 and biotinylated anti-CD45.2 followed by PE-conjugated streptavidin. The absolute number of donor CD8+ T cells was calculated based on flow cytometry analysis. One representative experiment of three is shown. ∗, p < 0.01. B, At day 5 following the cell transfer, leukocytes were prepared from the livers, spleens, and PLN of these mice and double-color-stained with CyChrome-conjugated anti-CD8 and biotinylated anti-CD45.2 followed by PE-conjugated streptavidin. The division of donor CD8+ T cells in vivo was analyzed by flow cytometry by gating on CD45.2+CD8+ T cells. C, The percentage of divided CD8+ T cells was calculated based on the flow cytometry analysis. One experiment with three mice in each group, representative of three independent experiments, is shown. ∗, p < 0.05. It has been previously demonstrated that host APCs, particularly DCs, trigger the proliferation of allogeneic CD8+ T cells in the immediate post-BMT period (8). Based upon these findings, we next determined whether lipo-clodronate-mediated depletion of macrophages and DCs affects the activation and proliferation of donor CD8+ T cells. As shown in Fig. 2⇑, B and C, donor C3H.SW CD8+ T cells in the spleens, PLN, and MLN recovered from control B6 recipient mice at 5 days following T cell infusion included CD8+ T cells that had undergone as many as six divisions in vivo. However, pretreatment of B6 recipients with lipo-clodronate inhibited donor C3H.SW CD8+ T cell proliferation in the spleens, but not PLN and MLN, increasing the number of splenic CD8+ T cells limited to a single division by 3.3-fold (Fig. 2⇑, B and C). In contrast, >90% of donor CD8+ T cells that were recruited into the liver, in both lipo-clodronate-treated and control B6 recipients, had undergone at least four divisions (Fig. 2⇑, B and C). Taken together, these results suggest that DCs and macrophages in the secondary lymphoid tissues are critical for the activation and proliferation of donor CD8+ T cells, whereas resident hepatic APCs are required for the recruitment of previously activated donor CD8+ T cells into the liver. We next asked whether the decreased recruitment of activated donor CD8+ T cells into the liver is reflected in clinical improvement of acute GVHD. Histological examination of tissues from the recipients of C3H.SW T−BM+CD8+ T cells at 14 days after the transplant demonstrated that the accumulation of mononuclear cells was significantly decreased in the portal areas of the livers from lipo-clodronate-treated B6 as compared with those of the controls (Fig. 3⇓, A and B). Notably, infiltration of CD8+ T cells into hepatic sinusoids, where Kupffer cells normally reside, was completely blocked in lipo-clodronate-treated mice (Fig. 3⇓A). Furthermore, the number of effector CD8+ T cells producing IFN-γ was also decreased significantly in the livers and spleens from lipo-clodronate-treated B6 recipients (Fig. 3⇓C). In parallel, there was marked reduction of the serum ALT levels (Fig. 3⇓D) and less weight loss (Fig. 4⇓A) in lipo-clodronate-treated B6 recipients of C3H.SW T−BM and CD8+ T cells. Consistent with these observations, 21.1% (n = 19) of lipo-clodronate-treated recipients of C3H.SW T−BM and CD8+ T cells died from acute GVHD vs 60.7% (n = 23) of control B6 recipients (p < 0.01, Fig. 4⇓A). Depletion of splenic and hepatic macrophages and DCs reduces the accumulation of allogeneic CD8+ T cells in liver. Naive C3H.SW CFSE-labeled CD8+ T cells (2 × 106; CD45.2+) were mixed with T−BM cells (7 × 106) and i.v. injected at day 0 into lethally irradiated B6/SJL recipients (CD45.1+) that had been previously treated with liposomes or lipo-clodronate at day −7 and day −2. A, At day 14 following the cell transfer, livers were harvested from mice and sectioned for H&E and immunohistochemistry staining with anti-CD8 Ab as described in Materials and Methods. Magnification, ×100. B, Leukocytes were prepared from the livers of control and lipo-clodronate-treated B6 recipients and numerated. ∗, p < 0.01. C, Shown is the absolute number of donor CD8+ T cells secreting IFN-γ in the livers and spleens from the recipient mice. The expression of IFN-γ in CD8+ T cells was quantified by flow cytometry as described in Materials and Methods. One representative experiment of three is shown. ∗, p < 0.05. D, Serum ALT levels in the recipient mice at day 14 following allo-BMT. ∗, p < 0.05. Organ-specific depletion of host macrophages and DCs reduces the mortality but not the incidence of acute GVHD mediated by allogeneic CD8+ T cells. A, Recipient weight loss and survival rate. B6 mice received the systemic administration of lipo-clodronate or liposomes at day −7 and day −2 and were lethally irradiated (9.5 Gy) at day 0. C3H.SW T−BM cells (7 × 106) mixed with C3H.SW CD8+ T cells (2 × 106) were transplanted into the recipients immediately following the lethal irradiation. The data of weight loss are representative of three independent experiments, and the survival is plotted from three experiments. B, The clinical signs of cutaneous inflammation, such as fur ruffling, hair loss, skin rashes, and ulcers, were recorded twice a week. C, Skins were harvested from the recipients at day 35 to day 55 and sectioned for H&E staining as described in Materials and Methods. Magnification, ×100. In contrast, cutaneous GVHD, as manifested by fur ruffling, hair loss, skin rashes, and ulcers, developed identically in both the control B6 and lipo-treated B6 recipients of C3H.SW T−BM and CD8+ T cells (Fig. 4⇑, B and C). 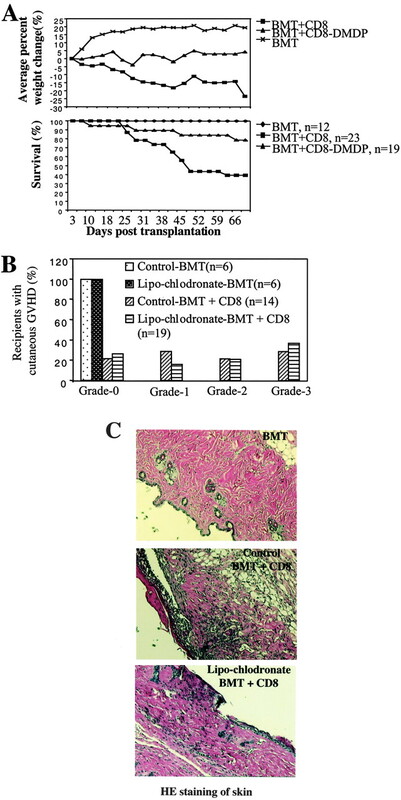 These results indicate that the decreased recruitment of activated donor CD8+ T cell into the liver and spleen caused by lipo-clodronate treatment significantly inhibits hepatic GVHD, whereas cutaneous GVHD is not affected. These results suggest that host APCs may play an important role in the effector phase of acute GVHD, independent of their role in triggering the activation and proliferation of allogeneic T cells at the early phase. To test this hypothesis directly, we used adoptive transfer to distinguish early T cell activation from the subsequent effector phase of acute GVHD. CFSE-labeled C3H.SW CD8+ T cells (CD45.2) and T−BM cells were first transplanted into lethally irradiated primary B6 recipients (CD45.1) to induce the activation and proliferation of T cells. Six days later, activated donor CD8+ T cells were prepared from the spleens, PLN, MLN, and livers of these primary B6 recipients by depletion of CD4+, CD11c+, CD11b+ and CD45.1+ cells. These enriched, activated donor CD8+ T cells were transplanted, along with C3H.SW T−BM cells, into lipo-clodronate-treated or control secondary recipients that had been lethally irradiated 3 days before the adoptive transfer. The migration of these in vivo-activated donor CD8+ T cells into the local tissues of the secondary recipients was examined 20 h following adoptive transfer. As shown in Fig. 5⇓, the number of activated donor CD8+ T cells in lipo-clodronate-treated secondary recipients was markedly decreased in the livers and spleens by 88 and 86%, respectively, but relatively increased in the PLN by 55%, compared with the tissue-specific infiltration in control B6 recipients. Thus, even when appropriately primed by normal APCs, activated allogeneic CD8+ T cells require additional, local signals from tissue-resident APCs for their accumulation in local tissues. In particular, APCs in the liver are critical for initiating the migration of activated allogeneic CD8+ T cells into the liver. Depletion of hepatic macrophages inhibits the migration of activated donor CD8+ T cells into the livers. C3H.SW T−BM and CFSE-labeled CD8+ T cells (CD45.2+) were first transplanted into primary B6 recipients (CD45.1+). Six days later, lymphocytes were prepared from the spleens, PLN, MLN, and livers of these primary B6 recipients and depleted of CD4+, CD11c+, and CD11b+ cells. The resultant donor CD8+ T cells were mixed with freshly isolated C3H.SW T−BM cells (7 × 106) and adoptively transferred into the secondary control or lipo-clodronate-treated B6 recipients. These secondary recipients were lethally irradiated 3 days before the adoptive transfer. The migration of in vivo-activated allogeneic CD8+ T cells into the liver, spleen, and PLN of the secondary recipients was examined at 20 h following the adoptive transfer. A, Immunofluorescence staining of cells was performed as described in Materials and Methods. Dot plots show the cells from liver, spleen, and PLN stained with CD8 and CD45.2 Abs. B, The absolute number of activated donor CD8+ T cells in the liver, spleen, and PLN was calculated based on the overall number of mononuclear cells and flow cytometry analyses from the secondary recipients of adoptively transferred activated donor CD8+ T cells. Data reflect an average of three to four recipients from each group. One representative experiment of two is shown. The development of acute GVHD involves three phases: 1) T cell activation, 2) proliferation and differentiation of allogeneic T cells into GVHD effectors, and 3) specific tissue damage (1, 2, 9, 34). We have previously demonstrated that host APCs are critical for triggering the activation and proliferation of allogeneic CD8+ T cells, leading to acute GVHD in an miHA-mismatched murine model (6). These first two phases occur rapidly, with allogeneic T cells activated on host APCs within 24 h after transplantation (7). In this study, our results indicate that host tissue-resident macrophages and DCs play an additional role by recruiting allogeneic CD8+ T cells into their local tissues during the effector phase of acute GVHD. Depletion of hepatic and splenic macrophages and DCs significantly decreased the rapid trafficking of activated donor CD8+ T cells into the liver and spleen, thereby inhibiting hepatic, but not cutaneous, GVHD. Thus, the distribution of host tissue-resident APCs may direct the organ-specific phenotypes of acute GVHD. The significantly reduced T cell hepatic infiltration and hepatitis (decreased serum ALT levels) likely contribute to the overall improvement of clinical status of the clodronate-treated mice, including the prevention of weight loss and improved survival. Previous studies have shown that both DCs and macrophages are critical for eliciting T cell-mediated immunity in various animal models (21, 35, 36, 37). 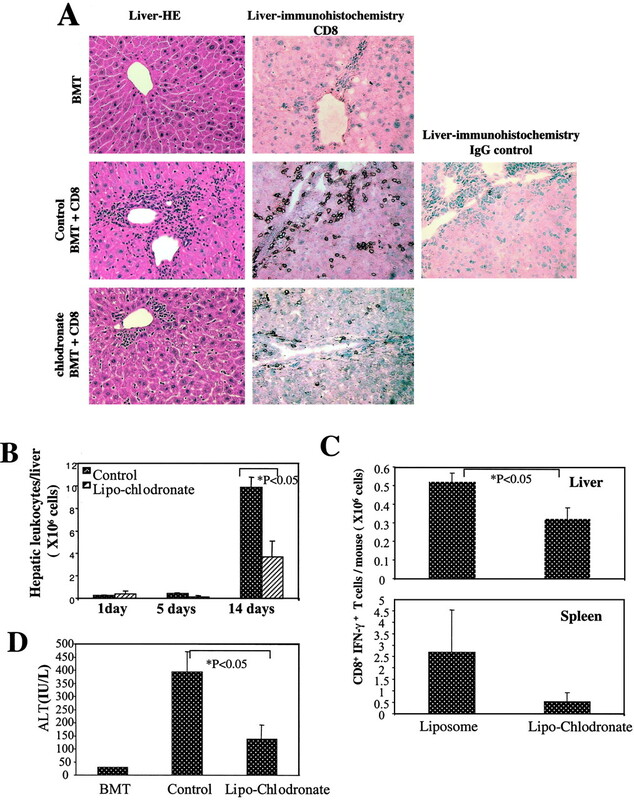 Single dose injection of lipo-clodronate via tail vein inhibited the induction of CTL responses against liposome-encapsulated Ags in the spleen (36) and viral Ags in the livers of immune-competent mice (33). In nonobese diabetic mice, depletion of local tissue macrophages by lipo-clodronate resulted in a deficit of T cell activation and a decrease in Th1 immune response, but an increase in Th2 immune response (37). We found that depletion of macrophages and DCs in the spleen by lipo-clodronate treatment significantly inhibited the activation and proliferation of donor CD8+ T cells in the spleen, but not in PLN and MLN. We have previously demonstrated that host DCs are rapidly eliminated from the recipients during the first week following preparative irradiation. Delayed infusion of C3H.SW donor CD8+ T cells into B6 recipients at 5 days following preparative irradiation significantly decreases the proliferation of donor CD8+ T cells in the recipients (7). These observations show that host APCs, particularly DCs, are essential for triggering the proliferation of allogeneic CD8+ T cells. In the present study, depletion of APCs, including DCs and macrophages, from the spleen, but not from the PLN and MLN, of lipo-clodronate-treated mice leads to the abrogation of local presentation of antigenic and costimulatory signals for T cell activation and proliferation. This may account for the inhibited proliferation of CD8+ T cells in the spleen, but not in PLN and MLN, of lipo-clodronate-treated mice. Thus, the decreased recruitment of allogeneic CD8+ T cells into the livers, which we observed in lipo-clodronate-treated mice, could theoretically have been caused by a reduction of T cell activation and proliferation. However, adoptive transfer of fully activated CD8+ T cells into lipo-clodronate-treated secondary recipients still resulted in greatly reduced hepatic infiltration. Therefore, resident tissue APCs have an essential role in the evolution and development of GVHD beyond T cell activation, at the level of T cell recruitment into target tissues. The molecular mechanisms by which tissue-resident macrophages and DCs attract and retain allogeneic T cells in GVHD target tissue are not known. It has been shown that liver allogeneic CD8+ T cells up-regulate their surface expression of chemokine receptors CCR1, CCR4, and CXCR3 at day 7 and CCR5 at day 14 after being transplanted into the recipients (15). Blocking the activity of either macrophage inflammatory protein-1α (MIP1α) or its receptor CCR5 by neutralizing Abs can significantly decrease the trafficking of effector CD8+ T cells into the liver at day 14 after the transplant (15). A recent study (17) indicates that activated donor T cell-derived MIP1α itself may play a critical role in chemoattracting more effector CD8+ T cells, suggesting a positive feedback loop leading to accumulation of effector T cells in the liver. However, allo-BMT can also induce the production of MIP1α in several other organs, such as the kidneys and pancreas, which are apparently not the main targets of acute GVHD (1, 2, 15, 17, 34, 38). Therefore, the data available to date do not identify the primary initiator(s) of inducing the entry of activated CD8+ T cells into the liver. An intriguing aspect of our findings is that activated allogeneic CD8+ T cells recruited into the recipient liver had already undergone as least four divisions. This indicates that allogeneic CD8+ T cells recruited into the recipient liver had been activated and undergone proliferation, probably in lymphoid tissues, before their migration into GVHD target organs. These data imply that the primary role of liver APCs in the development of GVHD may be as a cellular magnet, attracting activated allogeneic T cells specific for host tissue Ags. Although there is still a controversy as to whether hepatic APCs might themselves be capable of inducing the allo-specific responses (39, 40), it is clear that activated Kupffer cells can produce high levels of IL-6, TNF-α (41, 42, 43, 44, 45, 46), and chemokines such as MIP1α (15). Thus, hepatic macrophages could direct the trafficking of activated allogeneic CD8+ T cells into the liver by the means of the chemokines secreted either by hepatic macrophages themselves or by other cells in the liver via the proinflammatory stimulation of macrophage-derived IL-6 and TNF-α, leading to hepatic GVHD. In addition, it is possible that APCs in the liver might provide a survival signal for these intrahepatic CD8 T cells to persist in the liver. Although previous studies have demonstrated that i.v. injection of lipo-clodronate is not toxic to lymphocytes in vivo (23, 25, 36), the total numbers of T, B, and NK cells were indeed reduced in the spleen, but not PLN and MLN, by day 5 following lipo-clodronate treatment alone in our studies, in proportion to the measured overall decline in cellularity. However, no depletion of T, B, or NK cells was observed at 24 or 48 h, in our studies or in published reports (23, 25, 36). Inasmuch as we have shown that activation of donor T cells in the spleen by host APCs is complete by 24 h following allo-BMT (7), this relatively late, but accelerated, decline in host lymphoid cells is unlikely to impact on allo-activation of donor T cells. Moreover, it is well known that lethal irradiation itself can completely eliminate lymphocytes in the secondary lymphoid organs and peripheral tissues, which still support the essential role of APCs in allogeneic T cell activation and effector T cell recruitment. Thus, it is unlikely that the reduced host lymphocytes in vivo are responsible for either the rapid recruitment of allogeneic CD8 T cells into GVHD target organs, such as liver and spleen, or the failure of this process in lipo-clodronate-treated mice. In this study, lipo-clodronate treatment reduced the recruitment of activated donor CD8+ T cells into the liver, resulting in decreased hepatic inflammation and improved survival. These findings contrast with those of Everse et al. (47), who found that lipo-clodronate treatment did not decrease acute GVHD in mice with allo-BMT. Although the explanation for these disparate results is unclear, certain differences between the studies are noteworthy. We used highly purified naive C3H.SW CD8+ T cells to induce acute GVHD in B6 recipients, whereas Everse et al. (47) used unfractionated donor C3H.SW T cells, containing CD8+ and CD4+ T cells and DCs as well. Most importantly, in Everse’s study (47), most of the recipient mice that were treated with lipo-clodronate died from secondary infection in the peri-BMT period. Thus, effects on organ-specific GVHD may have been masked or overwhelmed by severe infection and inflammation in thesemice. In addition, we have found that treating the mice with lipo-clodronate several days before BMT is essential for blocking hepatic GVHD. In the present study, we did not observe an increasing infection in lipo-clodronate-treated recipients, and we found a clearly beneficial effect of depletion of host tissue-resident macrophages and DCs on local inflammation in the target organs and in improving the severity of acute GVHD. In conclusion, our data suggest that the resident APCs in the liver and spleen are critical for recruiting activated donor CD8+ T cells into the liver during the effector phase of acute GVHD. Although host DCs are eliminated from the secondary lymphoid organs during the first week following the preparative irradiation (7), most of host tissue macrophages such as Kupffer cells and alveolar macrophages may not be as rapidly replaced by donor bone marrow cells (48). Previous studies by Teshima et al. (8) demonstrated that host APCs that survive irradiation and still reside in target organs or secondary lymphoid tissue are critical to the induction of T cell-mediated GVHD. In this study, our findings further provide a mechanistic explanation for the requirement of host APCs in GVHD target tissues, i.e., such radio-resistant tissue APCs may play an essential role in recruiting activated allogeneic T cells into target tissues, resulting in tissue-specific GVHD. Of note, which APC subsets (e.g., macrophages, DCs) play the dominant role in recruiting/retaining activated CD8+ T cells to GVHD target tissues, and by what molecular mechanisms this recruitment/retention process occurs, is not yet known. Further understanding the molecular basis by which host tissue APCs interact with and focus allogeneic CD8+ T cell activities to mediate acute GVHD in the target tissues may identify promising targets for the development of novel strategies to prevent acute GVHD. ↵1 This work was supported by grants from the Leukemia and Lymphoma Society of America. ↵3 Abbreviations used in this paper: GVHD, graft-vs-host disease; PLN, peripheral lymph node; MLN, mesenteric lymph node; BMT, bone marrow transplantation; allo-BMT, allogeneic BMT; miHA, minor histocompatibilty Ag; lipo-clodronate, liposomal clodronate; T−BM, T cell-depleted bone marrow; MIP1α, macrophage-inflammatory protein-1α.